On a remote island of glass surrounded by a sea of acid, there is a machine that can remove evil from the minds of an entire population – the Conscience of Marinus. Fearful of its immense power falling into the wrong hands, its sole guardian has scattered the machine’s operating keys across the planet. The TARDIS crew arrives to find the island under attack by the evil Voord. Marinus’ last line of defense – and its only hope – is the Conscience machine. 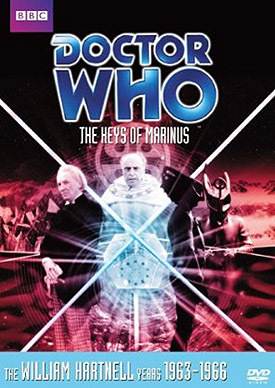 The Doctor and his companions must undertake a deadly quest to recover the keys of Marinus. • Commentary with actors William Russell and Carole Ann Ford, director John Gorrie and designer Raymond Cusick. Moderated by Clayton Hickman. • The Sets of Marinus (dur. 9' 25") - designer Raymond Cusick recalls his work on this story. • Photo Gallery (dur. 7' 25") - production and publicity photos from the story. • PDF Material - Radio Times listings plus the entire set of Cadet Sweets 'Doctor Who and the Daleks' sweet cigarette cards in Adobe pdf format for viewing on PC or Mac.